St. Maarten 1408- 3bd BEACHFRONT resort condo! Multiple pools, spa, fitness center, and on site restaurant. Free Wifi!! Gena and her team at Destin Beach Realty were very honest and wonderful to work with! We have stayed at the Silver Shells in the St. Maarten unit on several occasions. We love the building, the gulf front view, the private elevator, reserved parking, the huge pool, paths to the Candy Maker and the Back Porch, the workout center and basketball and tennis courts. I was hesitant to rent 1408 at first because of the not so great reviews given in 2017, but since then Gena and the team at Destin Beach Realty assured me that the owner had updated the condo. They were right! This unit is very clean and comfortable! We enjoyed our stay in Destin very much. St. Maarten is the closet rental property to the beach within the Silver Shells Resort & Spa. St. Maarten sits on the Southern side of the resort. St. Maarten is a really unique condo. From the elevator you will walk directly into unit 1408! No hall ways to walk down, just directly into your little piece of paradise! The condo features flat screen TVs in all rooms, floor to ceiling windows with views of the Gulf of Mexico from the living room, dining area, kitchen, master bedroom and large private balcony. The dining area and living room are side by side making entertaining a breeze. You can enter the Gulf side tiled balcony from the living room or dining area and enjoy views of the Gulf and Destin. The master bedroom faces towards the Gulf and has access to the Gulf side balcony too. The master bedroom has not one but TWO closets. One being a walk-in closet and the other being directly across from it with bi-fold doors. Great place to store your luggage after you’ve unpacked. This room features a flat screen TV & DVD player. Enjoy a private bathroom w/ garden tub, stand alone shower and double vanities. The master bedroom also has balcony access and Gulf views! Your first guest bedroom features two queen beds, sleeping 4 total, a private bathroom and access to the shared, city side balcony that has gorgeous views of the City of Destin. This bedroom features a flat screen TV & DVD Player. The third guest bedroom features a king bed, flat screen TV & DVD player and access to the shared, city side balcony with views of the city of Destin. The hall bathroom is directly next to this room! Unit 1408 includes a huge, tiled balcony with balcony furnish to allow you to truly enjoy that million dollar view! Also, no need to worry about laundry as this unit has a huge laundry room w/ washer/dryer & sink. Walk right out your back door (located off of Laundry Room) to the trash chute. St. Maarten @ Silver Shells is a remarkable property. Enjoy the views, the condo, the amenities and create memories your family will cherish forever. The Silver Shells Resort features several pools, including an indoor pool, gorgeous lagoon style pool with tons of seating around it to ensure everyone in the family can kick back and relax and also the much desired kiddie pool. Enjoy hot tubs & grilling areas too. Silver Shells Resorts also offers their indoor/outdoor pool which is located near the Basketball Court & Tennis Courts. Lush landscaping, Tennis Courts, Basketball Courts, Childrens Playground, Childrens Pool, Hot Tub, Fitness Center, Tiki Beach Bar & Grill (seasonal), BBQ Grills and Covered Parking are just a few featured items at the Silver Shells Resort! By staying in Silver Shells Resort, you understand and agree to abide by our rules and policies. These policies were established to help ensure your, and your neighbors, peaceful enjoyment of all common areas as well as your condominium. 2 Bedrooms sleep 6; 3 Bedrooms sleep 8. If security suspects you have more people staying in your unit than what is stated here, it will be reported to your rental company. If the report is found to be accurate, you will have to leave and forfeit your remaining days rent. Children 3 years of age and younger are not counted in the occupancy total. 1,	Additional day visitors must be called in and registered to the Gate House. 2. Only the responsible paying guest may register a visitor (no children may register visitors). 3. No more than 6 additional visitors are allowed during any one day. 4. Non-registered Day Visitors will not have access to the property..
5. Wrist bands are required at the pool deck. Only rental companies issue wrist bands. Anyone at the pool deck without a wrist band will be asked to retrieve it. Day Visitors without wrist bands may only use the beach. Beverages may be confiscated, parent/guardian will be consulted, Sheriff Department may be called without notice. Guests should refrain from using crude language or creating loud noise (verbal shouting or music). Our goal is all guests peacefully enjoy their time at our resort. 1. Throwing, dropping, or pouring anything off a balcony is prohibited and may result in eviction and forfeiture of unused rent. Parents are urged to instruct your children and make them aware of how they could shorten your stay. 2. Towels, flags, and banners are not to be hung from balcony railings. 3. Loud music and shouting from balconies is prohibited. Repeated complaints will result in the Sheriff Department being called to your unit and possible eviction. Gates within the Resort and rental buildings require key card access. Please be sure you request an adequate number of key cards for your party at check in, from your rental company. Fence jumping is prohibited. Pets: Only owners of Silver Shells Resort are allowed to have pets on site. Pets are not allowed for rental guests. This condo does have a view of the city from the city side of the condo, the side that faces away from the beach..
Beachfront, directly on the beach! This beachfront condo features beach views from the living room, dining area, kitchen, master bedroom and extended and large balcony! All linen is provided with the exception of beach/pool towels. Beach views from this full equipped kitchen with all modern appliances. The dining area features beach views. Six people can be seated at the dinner table and there are three bar stools nearby also! Multiple private balconies. One faces the beach with beach views and the other is city side. Destin has access to many different golf courses! St. Maarten is part of the Silver Shells resort and offers incredible amenities including multiple pools, one of which is indoor. 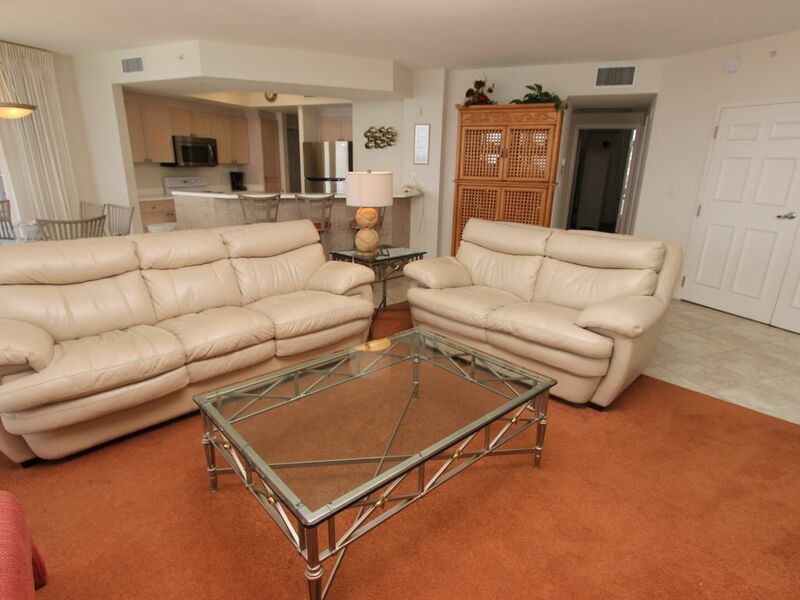 Spacious tiled balcony with furnish allows you awesome views of the Gulf and the City of Destin. The property also has a playground for the kids, a kiddie pool, lagoon style pool, indoor/outdoor pool, hot tubs and direct beach access! Accommodations pleasantly met our needs for a 4-day stay. Unit 1408 was quiet and provided nice view of beach. Beach chairs and boards provided were appreciated. Heated outdoor pool was welcomed. Compared to other units we have rented in area, this unit needed updating in bathrooms. One closet door was not functional. While VRBO specifies they do not provide paper towels, napkins, dish soap, extra toilet tissue, coffee filters, etc. , we have had these supplied at other rentals for this price. Thank you for taking the time to leave a review. I'm glad that you enjoyed your stay. St. Maarten 1408 has an amazing view of the beach! Having the heated pool is an added bonus. :) I don't show that we were contacted about the closet door. Had we been, we could have sent maintenance by to fix it. As stated in the terms and conditions and pre-check-in email, we only supply the initial set ups of garbage liners, toilet paper, paper towels, soaps, dish detergent, etc. The only downfall to our trip was having to excavate due to the hurricane. It was a great vacation with just a little hiccup from having to excavate from the hurricane. But Destin Beach Realty and the owner of our condo were great. We were reimbursed for the two days that we had to be away. We loved the condo at Silver Shells! We had amazing views. The kitchen was very well equipped for cooking in. We are hoping that our family will be able to return to this same condo for another beach vacation in the future! We are so happy that you enjoyed your stay! We would love for you to stay with us again! Nice condo, great location. Not enough towels provided and no cabinet space or pantry to put away our food and supplies. It had the perfect amount of space and beds for our family of ten. Loved the large balcony but not the angled style view of the beach. In need of a decor update. Great condo. Loved it. Perfect for us. Thank you for submitting a review. St. Maarten 1408 is a great condo! We would love to have you stay with us again.